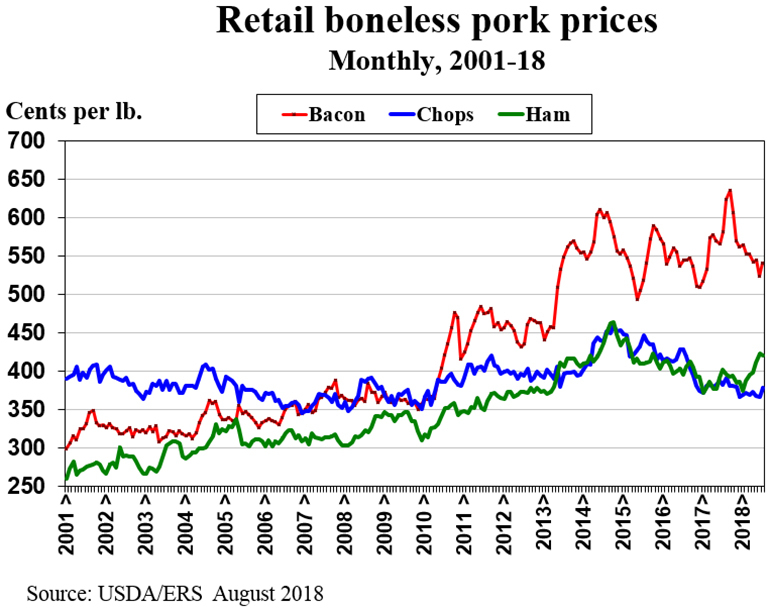 Falling retail bacon prices appear to cause drop in pork belly prices, thus driving pork cutout values lower. Bright spot: high corn yield drive prices lower. Hog prices have been falling like a rock during the last two months. The national average negotiated carcass price on USDA’s Friday afternoon report was $40.52 per hundredweight, down $4.53 from week earlier, down $31.34 from a month earlier, down $42.28 from two months earlier, down $45.30 from a year earlier, and the lowest negotiated afternoon price for any day since Nov. 11, 2016. It was even worse for the Iowa-Minnesota hog price. 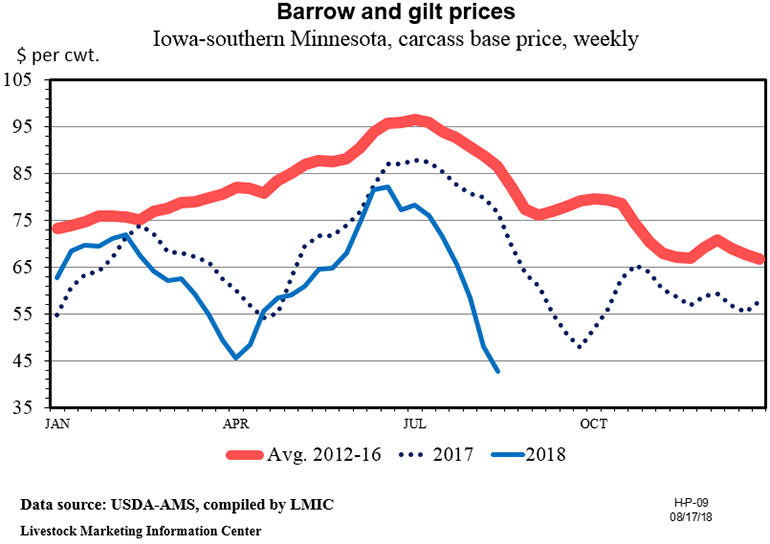 On the Friday afternoon report, the average Iowa-Minnesota negotiated carcass price was $40.13 per hundredweight, the lowest Iowa-Minnesota negotiated price on the afternoon report for any day since Dec. 26, 2002. That is more than 15 years ago. Ouch! Fortunately for producers, most hogs are priced by formula rather than negotiated sales. The average base price received for producer-sold hogs late last week was “only” the lowest since December 2016. A decline in hog prices is certainly not unusual for late-summer. This year the price decline started early and went deeper than normal. The primary cause is lower cutout value. Friday afternoon’s pork cutout value, FOB the slaughter plants, was $66.77 per hundredweight, the lowest since April 13. 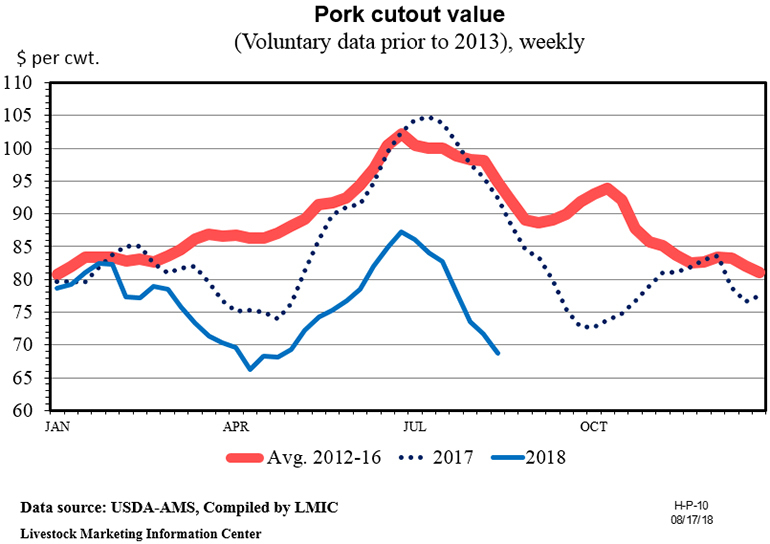 The drop in the pork cutout value was due mostly to a big drop in pork belly prices. 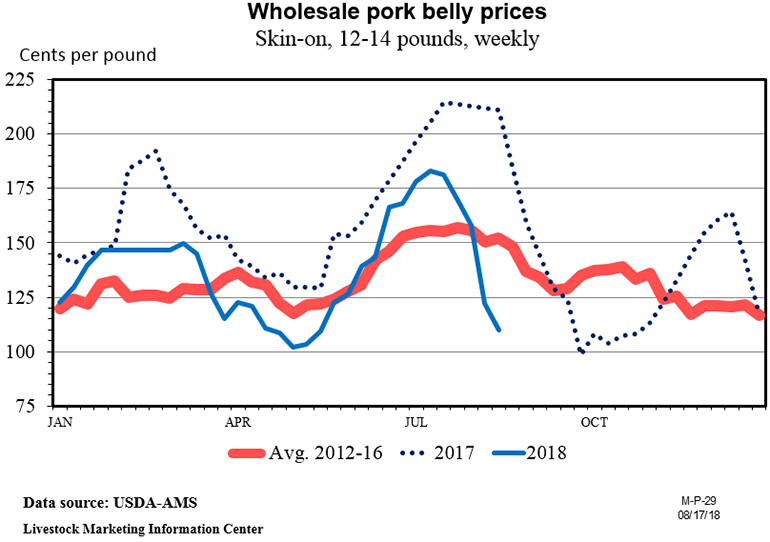 The average wholesale price for the pork belly primal on Friday afternoon was $79.07 per hundredweight, FOB the plants, down $16.68 from a week ago, down $92.96 from a month ago, down $129.40 from a year ago and the lowest afternoon price for any day since May 14, 2015. This price drop is doubly worrisome since August pork belly prices are usually near their annual peak. It appears the decline in pork belly prices is related to a drop in retail bacon prices. In July, the average price for bacon in grocery stores was 40.1 cents per pound lower than in July 2017. July retail ham prices were 19 cents per pound higher than a year earlier and boneless pork chops were down only 3.1 cents, year-over-year. Bacon demand has been very strong in recent years. Is the bacon demand bubble coming to an end? There is an additional reason to question the strength of bacon demand. At the end of June, the supply of pork bellies in cold storage was up 129.9% (28.957 million pounds) year-over-year. 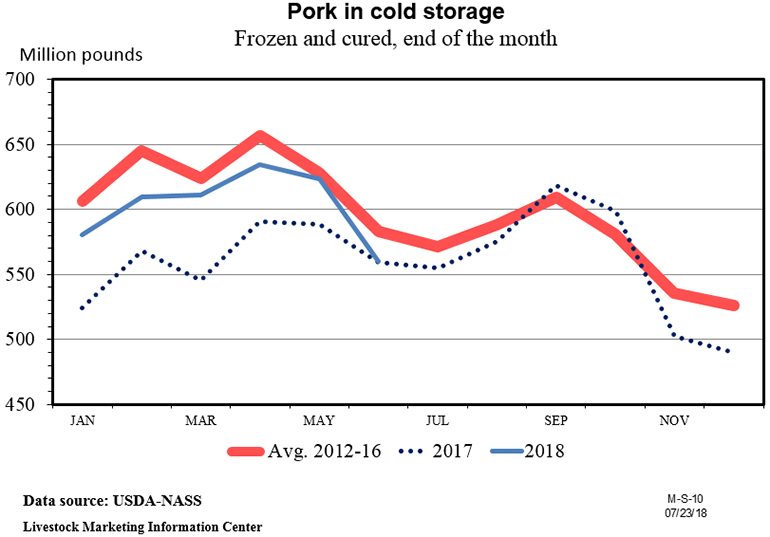 The supply of other pork in cold storage was down 5.2% (27.933 million pounds). Increasing stocks of frozen pork bellies may reflect weak bacon sales. On Wednesday afternoon, the USDA will release their monthly Cold Storage report. It is probably worth your time to check to see if frozen stocks of pork bellies are continuing to increase at a time of year when they usually decline. 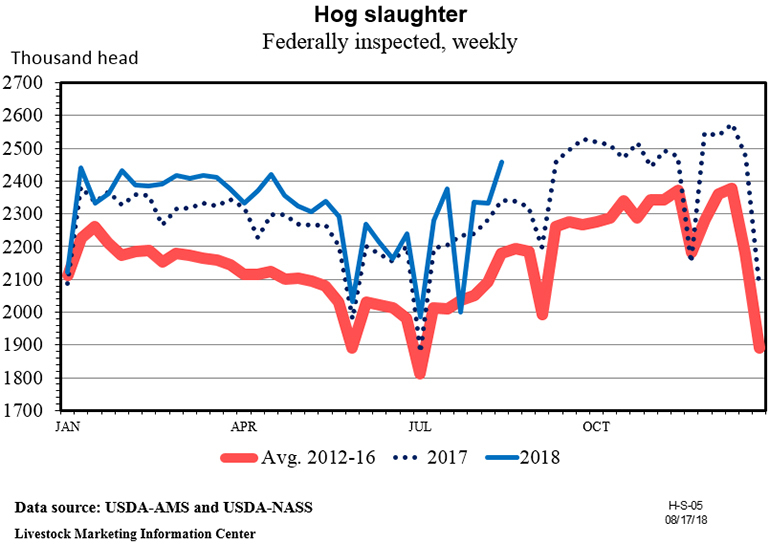 Last week’s hog slaughter totaled 2.459 million head, up 6.2% from the week before, up 5.1% from a year ago and the largest total for any week since thus far in 2018. Other than holiday weeks, weekly hog slaughter is likely to be consistently above 2.4 million for the rest of 2018. Another surprising thing about how low hog prices have been in recent days is that hog slaughter has been lower than indicated by USDA’s June 1 market hog inventory estimates. The market hog numbers implied that June-August market hog slaughter would be up 3.3% and thus far summer hog slaughter has been up only 2.3%. How low would hog prices have dropped if slaughter had been 1% above expectations rather than 1% below? Looking forward, the June Hogs and Pigs report implied fall slaughter will be up 3.5%. 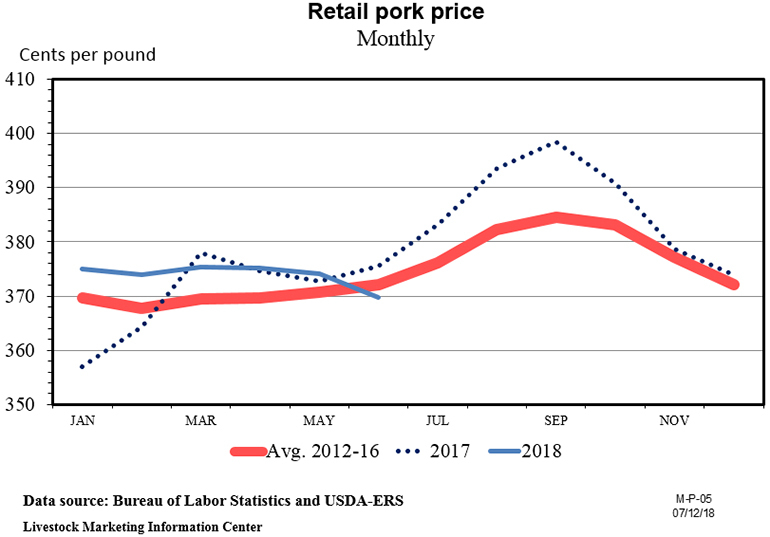 The average price for pork at retail during July was $3.731 per pound, up 3.4 cents from the month before, but down 10.2 cents from a year earlier. International trade has been a big plus for U.S. pork thus far in 2018. 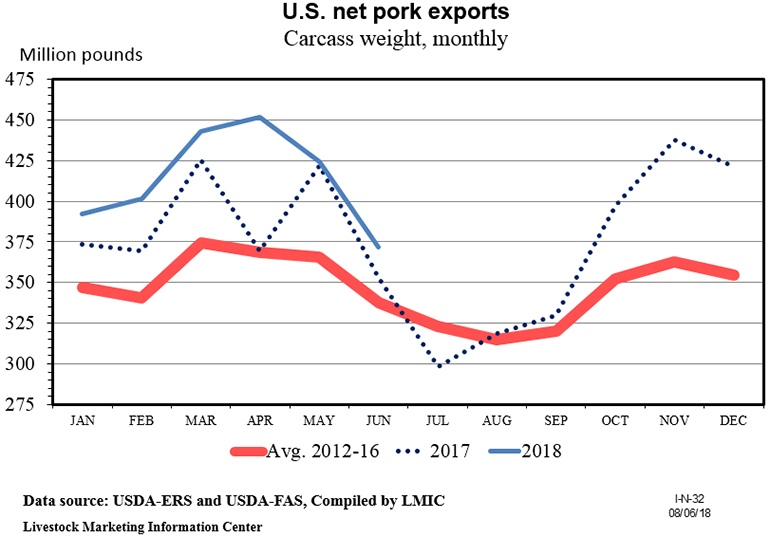 U.S. net pork exports (exports minus imports) were above the year-ago level each of the first six month in 2018. During the first half of 2018, pork exports were up each month and pork imports were down three of the six months. During the first half of 2018, U.S. pork production was up 3.4%, but pork exports were up 6.2% and imports were up only 0.7%. January-June pork exports equaled 23.4% of U.S. production and imports equaled 4.2% of production. Lee Schulz at Iowa State University estimated farrow-to-finish profits for July to be $10.82 per head marketed, down from a profit of $26.66 per head in June. July was the fourth profitable month for hog producers in 2018, but it may well be the last profitable month this year. Schulz estimates the breakeven price for July at $47.26 per hundredweight live or $63.01 per hundredweight carcass. Cost of production is likely to decline slightly as we approach harvest. In a bit of good news for hog producers, the USDA’s August World Agricultural Supply and Demand Estimates report predicted a record corn yield of 178.4 bushels per acre and lowered the marketing year average corn price forecast by 20 cents per bushel. On Thursday afternoon, USDA will release their monthly Livestock Slaughter report. Preliminary data indicate July hog slaughter was up 6.3%. July 2018 had one slaughter day more than last year. On a daily basis, July hog slaughter was up roughly 1.3%. The August Cattle on Feed report will be released on Friday afternoon. Poultry slaughter for July will also be published on Friday afternoon.